Why does Scrum have a sprint retrospective meeting? Scrum focus upon self-learning and self-organisation. Scrum teams can learn from their prior mistakes, and make efforts to identify them and correct them. Scrum framework is uniquely designed so that the teams can avail proper and reliable inputs from the process flow, identify potential pitfalls, and avoid them well before they can affect the product development process. One of the main practices in Scrum is to support the “inspect” and “adapt” principles that are so very important while implementing the framework in a project. These principles help in the self-learning and self-managing processes. Scrum supports a special meeting to support these principles – the sprint retrospective meeting. Sprint retrospectives are important for the Scrum process. Organisations and teams put in efforts to ensure that the retrospective remains productive and fruitful - in many ways, the retrospective event often decides the effectiveness of Scrum. Scrum experts have many suggestions as to what should, and what should not be done in a retrospective to make it effective. Here are a few common pointers which can be applicable to any retrospective meeting. Keeping an open and frank atmosphere during the retrospective can go a long way in increasing team participation. Team members should feel confident and safe while expressing their views and opinions. A common issue faced by many teams new to Scrum is that team members often do not feel comfortable while expressing their ideas, and stop contributing to the feedback process. The reasons could be many: A product owner or scrum master delegating authority in an improper manner, new team members not knowing much about how and why retrospectives are held in Scrum, or an unwillingness on the part of the team to participate in seemingly “unproductive” meetings. Whatever they may be, the scrum master should identify the reasons that are hampering team participation, and try to correct them. One of the biggest factors influencing a positive outcome of Scrum retrospectives is increased involvement of the team members in the process and their willingness to contribute new ideas. It is not just important to remove any impediments faced by the team, but also encourage the team to participate in the retrospective by motivating the team members so that they feel more involved in the Scrum process. The team should have a sense of ownership and feel responsible for what it contributes to the project. This can be ideally achieved by playing a servant-leader role. The senior team members should foster friendly yet formal communications with the subordinates so they feel more comfortable in what they do and feel. Sometimes, even when the Scrum master or senior team members do their best to foster healthy environment so the team can contribute effectively, some individuals in the team may simply fail to contribute. It may not be because they resent the process or don’t believe in it, but rather because they may be of an introvert nature and feel shy to stand in front of a crowd and voice their opinions. It may not be correct to force such a person to open up as it may make the person recede further into his/her shell. Ideally, such individuals need to be gently prompted with simple, straightforward questions that can invite answers from them. The senior members should understand the fact that individuals may have different types of nature, and some individuals may have to be “worked” upon before they can feel comfortable expressing their views and ideas. What should be improved upon? What to keep on doing? What new should be introduced? This method works well with teams that are sensitive to self-criticism. Scrum teams can be made to enjoy the retrospectives. Does the team like pizza? Then order a few rounds occasionally and hold the meeting while team members enjoy their pizzas. It’s one of the best ways to increase team morale and make people open up. Each event in Scrum is time boxed and the sprint retrospective is not an exception. The event should not drag on and on so it can become boring. On the other hand, if the objectives of the meeting are fulfilled before the time is up, don’t hesitate to end the meeting sooner even if the official time limit is still “not reached”. Each retrospective requires inputs from the sprint just completed and the sprint review event. During the retrospective event, the team tries to find out where it went wrong, and how errors can be corrected. Moreover, each retrospective ends with some course of action to be taken by the team to support the inspect and adapt principles. Retrospectives are a continuous process as long as the project lasts, and so proper call-to-actions ought to be worked out so each team member can self-correct and self-manage. The follow-up process should be effectively initiated and carried out to benefit from the meeting. 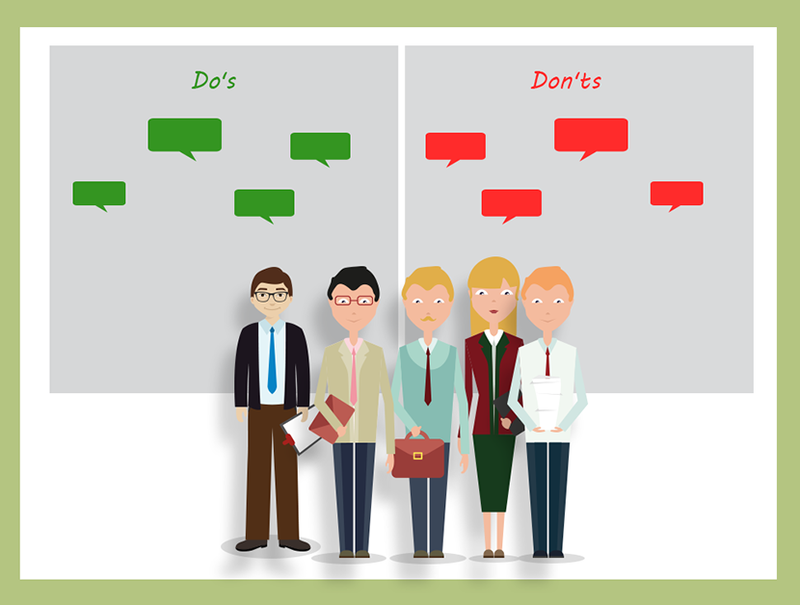 Don’ts – What should be avoided? Scrum is a joint effort encouraging collaboration. Scrum teams self-manage and self-organise. The retrospective is a fact-finding event and there could be instances where individual team members may become the centre of focus if they have made a mistake, and the mistake has been identified and openly discussed. The general tendency is to hold the individual responsible. However, this is not the intent of Scrum process. Rather than pointing fingers at people, the entire team should introspect and try to find the reason why the mistake occurred in the first place. Avoid playing the “blame” game and stop targeting individuals. Scrum advocates frankness and open-minded discussions. Many a times, an individual may feel suppressed, or might feel dissatisfied with some thing or the other concerning the process. Rather than bottling up your emotions, they should be rationally expressed and conveyed to the team. There are two main benefits of disclosing your feelings – you get the “thing” out of your system so you feel relieved, and the team can deal with your issue and find a possible solution. This can only be possible when you voice your issue. So avoid supressing your feeling. If you’re not comfortable with something, or something bothers you, be open and discuss it out. Sprint retrospective is an important Scrum event. It should not be taken lightly. Sometimes stakeholders and technical team may desire to attend the retrospective. Stakeholders have a right to attend the meeting, however, they should refrain from disrupting the meeting flow. If the team feels uncomfortable discussing certain issues in presence of the stakeholders or visitors, it has a right to restrict certain individuals in attending the meeting. Scrum supports transparency, but it does not do so if the process flow is affected in any way or manner and the Scrum process is made ineffectual.